For most of my adult life, I have experienced respiratory issues on and off, especially at certain times of the year. Coughing, wheezing and shortness of breath have been pretty common for me. Sometimes it’s not too bad, but sometimes it’s bad enough to hamper my quality of life and test the patience of my dear wife. I always chalked it up to some sort of allergies because it always seemed to go away eventually. In the fall of 2017, just over a year ago, I experienced a bout of this that I simply could not shake. Week after week I struggled, sometimes coughing so hard I nearly fainted and almost never sleeping through the night. I used a nebulizer machine just to get by. Finally, in late October, my wife convinced me to see our family physician at the TCHC Verndale clinic. After some simple exams and testing, the doctor suggested that I may be in the early stages of chronic obstructive pulmonary disease (COPD). It’s an inflammatory lung disease that causes obstructed airflow and difficulty breathing. He asked me to have additional testing to confirm and prescribed an inhaled medication that I used four times per day in a nebulizer. The suggested tests consisted of a chest CT scan and a pulmonary function test. Given the cost of the two tests, and the fact that at that time I was self-employed and buying my own health insurance (with a very large deductible), I thought I would wait on the tests. After a couple of convincing follow-up phone calls from the nurse, and considering that I had lost a brother to lung cancer, I went ahead with the tests and did confirm the COPD diagnosis. The COPD is almost certainly the result of being a smoker in my younger years. Upon diagnosis, I was prescribed the continued use of the inhaled steroids and a rescue inhaler that I carried with me in the event of an issue between nebulizer treatments. Late November is when I began learning to cope with the disease and figuring out a way to live a normal life in spite of it. I used the nebulizer four times per day and scheduled my work around that. Oftentimes, I would wake in the middle of the night and need to use the machine to be able to breathe. After a few frightening nights where I wasn’t sure I would make it to the machine, I moved it from the kitchen to the nightstand. I would often be doing a 2 a.m. treatment while checking email and surfing the internet. Suffice it to say, my sleep was not restful, and I was extremely tired most of the time. In January of this year, I accepted a position in the IT department at Tri-County Health Care. It’s exciting to have a new career, but this presented me with real challenges in managing my disease. I went home for lunch every day and used my nebulizer and carried my rescue inhaler in my pocket. 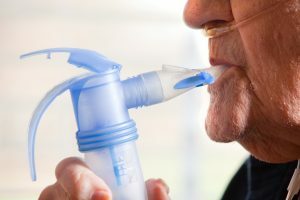 I’d find myself using the rescue inhaler frequently during the day and needing to walk around with a bottle of water to keep the constant desire to cough at bay. Frequently, I had to walk out of areas I was working in or leave a meeting because I would start coughing uncontrollably. I managed, but it was certainly a struggle. In March, my very wise wife suggested I have a follow-up visit with the doctor. My provider had recently retired, so I saw one of the TCHC clinic providers that came highly recommended by my peers at work. After discovering the extent to which I was using my meds, she suggested trying a stronger inhaled medication, something I would use just twice per day. The improvement was almost immediate. I discontinued the nebulizer completely and kept the rescue inhaler close just in case. I started sleeping through the night, and my wheezing and coughing fits became almost non-existent. So here I am a year later living a reasonably normal life. I do have limits. I often feel tired and do occasionally have trigger events that give me difficulties, although not even close to the level it was. I’ve used my rescue inhaler only a handful of times in the past six months. I avoid irritants like wood or tobacco smoke, mold and any kind of fine dust. When I do need to be in a questionable environment, I wear a high-grade dust mask so I don’t expose my lungs to irritants. I also have been cautioned to make sure I am vaccinated for influenza and pneumonia as respiratory illnesses can take a larger toll on someone with COPD. I know that over time the disease will progress, but given the medication I am on and the precautions I follow, I expect to live with a good quality of life for many years to come. About Doug: Doug Stromberg works in the IT department at Tri-County Health Care. He is a longtime Wadena resident and a graduate of Wadena-Deer Creek schools. Doug has worked in technology for almost 40 years. 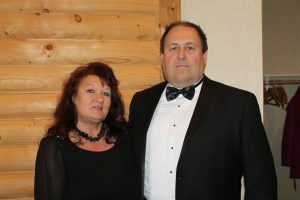 His background includes work in the telephone industry, cable television, radio broadcast engineering and many years as an instructor at Wadena Technical College (now M State). Prior to coming to work at TCHC, Doug operated a technical services company in partnership with his son, Mike. Doug is married to Jeannie and has two sons, two daughters-in-law and three grandchildren. His interests include his lake cabin and following Minnesota sports.